You may have heard about the hop shortage that started to bite in 2007. It came about as a consequence of poor harvests in Europe and the US—where we get most of our hops from—farmers converting to more lucrative crops—especially those subsidized by the US government for ethanol production—growing demand from China, and a 2006 warehouse fire in Yakima, WA, that wiped out a significant amount of the U.S. specialty hop supply. This shortage put the squeeze on a number of B.C.’s small brewers, nearly putting some out of business. Not only did the price of hops increase astronomically, it was difficult to even find a number varieties, particularly those used for making Northwest-style ales. For over 100 years, B.C. had a thriving hop-growing industry. But due to declining demand and business competition, the last hop farm in the province ceased operations in 1997. Consequently, our brewers are almost entirely at the mercy of outside sources. 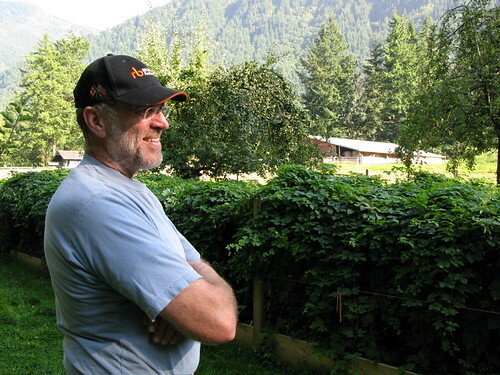 As a result, there has been an increased interest in reviving hop farming in B.C. Sorrento organic farmhouse brewer, Crannóg Ales, grow most of their own hops. They have two hop yards, for a total of just over one acre, where they grow Cascade, Challenger, Fuggles, Golding, Mt. Hood, Nuggett, and Willamette. Christian Sartori stands in front of his hop nursery on the Sartori Cedar Ranch (Photo © 2008 Rick Green). Last Wednesday, I visited one of the latest entrants in the province’s hop resurgence, Sartori Cedar Ranch. South of Chilliwack, in the Columbia Valley, Christian Sartori is preparing to transplant Centennial, Magnum, Newport, Sterling, and Willamette from a nursery onto three acres. He just took delivery of a shipment of wooden poles with which to construct trellises. Overseeing Sartori’s hop production is Rick Knight who was foreman at B.C.’s last hop farm, John I. Haas. We began the tour with a look at the field. It had already been excavated for the poles, so you could examine the underlying soil profile. It was also evident the field had good drainage. Despite recent rains, the surface was not saturated. We next visited the hop nursery. The rhizomes had only been planted this season, yet they were already sprouting hop cones. Given that they didn’t have to compete with grass and weeds for nutrients, they had also developed dense root systems. Knight anticipates they will be able to harvest half a hop crop at the end of next season and a full crop in 2010. The hop cones will be dried and then baled for delivery to customers. In the meantime, Sartori plans on planting another nine acres with whatever varieties local brewers are interested in. With initiatives like these, it’s a good opportunity for small B.C. brewers to form direct partnerships with growers that are otherwise not open to them. They can play a greater role in influencing their hop supply and not have to be as concerned they will be outbid or outmanoeuvered by the larger players in a sometimes volatile market.